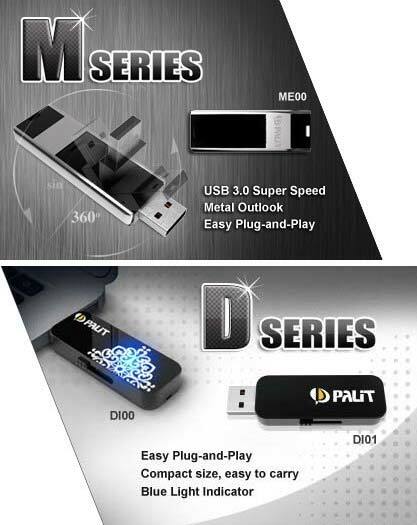 The Taiwanese company Palit has added new flash drives to its product list. Known for making graphics cards, now Palit enters the flash drive business too. Trying to capture the customers’ attention Palit now offers two series of portable flash drives – the D series and the M series. The D series is represented by two models – the DI00 and DI01. Both models feature USB 2.0 support and come in 4 GB, 8 GB, 16 GB and 32 GB capacities. The new D series flash drives measure 53 x 20 x 8 mm and weigh just 8 grams. The only difference between the two models lies in the outside packaging. The M series is the premium one Palit currently offers. It is represented by the ME00 model only, which comes with full USB 3.0 support and capacities of 16 GB, 32 GB and 64 GB. The ME00 model measures 60 x 21 x 7 mm and weighs 24 grams. Unfortunately Palit does not mention the read and write speeds of its new flash drives. Instead the Taiwanese company posted the environmental conditions under which the drives can be operated or stored. The new Palit flash drives can operate between 0 and +75 degrees Celsius and can be stored at temperatures between -40 and +85 degrees Celsius.